We have been calling for reform of the Human Tissue Act for over 8 years due to a loophole in the law which means issues of consent are not looked at for imported tissue. There are a number of commercial exhibitions such as Bodies Revealed and Real Bodies which exploit this by using "unclaimed bodies" from China (especially Dalian, China) where the cause of death is unknown and the grounds for consent often non-existent. Certainly, none of the above exhibitions have any consent for public and commercial exhibition of body parts for profit from the next of kin. Since 2010, other countries such as Israel and France have blocked such exhibitions as an undignified way to profit from the deceased without consent. We seek to stop such exhibitions in the UK, as they fundamentally go against the very spirit of what led to the Human Tissue. Act in the first place- namely the Alder Hey Scandal. 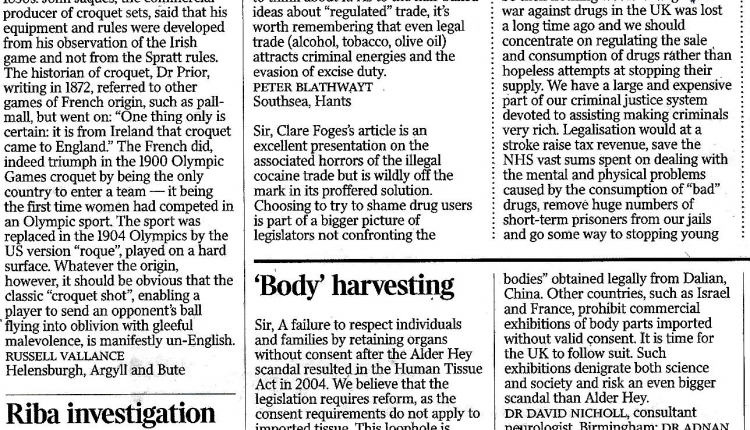 We aim to get this letter published on August 2nd to coincide with a lecture at Real Bodies in Birmingham. A failure to respect individuals and families by retaining organs without consent after the the Alder Hey scandal resulted in the Human Tissue Act in 2004. We believe the legislation requires reform as the consent requirements do not apply to imported tissue. This loophole is currently exploited by a number of exhibitions who source their bodies from countries with poor human rights records. In 2010, The Lancet called for reform of the UK law, and we are aware of at least three such exhibitions since that time. Today sees a lecture entitled “Why donate your body to science?” at the exhibition of Chinese corpses “Real Bodies” in Birmingham. Donation requires consent, legally, ethically and morally. The US organisers, Imagination Exhibitions, have been unable to provide any evidence for consent for their commercial exhibition of cadavers. The organisers merely state that they are “unclaimed bodies” sourced legally from Dalian, China. Others, such as Israel and France, prohibit commercial exhibitions of body parts imported without valid consent. It is time for the UK to follow suit. Such exhibitions denigrate both science and society and risk an even bigger scandal than Alder Hey. The Letter to national newspaper calling for reform of Human Tissue Act petition to Health care professionals, scientists, doctors was written by Dr David Nicholl and is in the category Law Reform at GoPetition.